There's a bewildering selection of over ear headphones out there, from bling, bulbous, fashion-focussed ones to altogether more serious, audiophile propositions but that's okay because we have the best over-ear headphones for all occasions and locations and budgets. We bring you the best headphones for listening at home – including open backed models – and the best over ear, wired headphones for taking on your travels – very much not including open backed models, as those may lead to your being physically assaulted. First up, it's worth bearing in mind that, other than for fashion reasons, there is no reason to buy brand new, hot-off-the-presses wired headphones. Unlike phones, where obsolescence sets in after about five minutes, and Bluetooth and noise-cancelling headphones, where the tech is still improving all the time, older wired headphones are generally just fine. This is a very 'mature' market in every sense. If a pair of wired headphones was great five years ago, chances are they are still great now. The most important thing to consider with headphones is are they open backed or closed backed. Open backed headphones can sound better, but they also leak sound like nobody's business. As such, they probably aren't suitable for taking outside or using to listen to music while other members of your household watch TV in the same room. Open headphones typically have a wider soundstage, giving the music room to breathe, which makes them exceptional for live recordings and classical concerts, where the scale of the performance can be appreciated. Closed models generally have a more direct and intimate soundstage with less sound leakage. As for technical jargon, frequency, measured in Hertz – typically 20-20,000Hz, the same as human hearing - shows the range of audio frequencies the headphones can reproduce, with the lowest figure being the bass, and the highest the treble. It's not an indicator of quality, but if you like bass, look for a low Hz. Finally, impedance, measure in ohms (Ω) is a useful signifier of quality, especially if you're planning to use headphones with a dedicated amp. Below 32Ω you'll have no issues using a smartphone, but quality will suffer through electrical vibrations. Higher quality models – especially for home use with a headphone amp – have much higher impedance. If at all possible, try headphones for sound before you buy. A handy benefit of over-ear headphones is that unlike in-ears, there's no hygiene issue with trying them on. If you're buying online, you can also make use of the wonder that is distance selling regulations and send back any pair you're not happy with, after conducting your own 'group test'. It's also essential to try on larger headphones to ascertain how comfortable they are as chances are you'll be wearing them for many an hour. That's especially true if you wear specs. It is quite amazing how many pillowy, soft-looking headphones actually act as a kind of torture device to glasses wearers, pressing the arms of your specs into your head, whilst going, "Is it safe?" like Laurence Olivier in Marathon Man. It's also worth bearing in mind that practically all Bluetooth on-ear/over-ear headphones come with a headphone cable, for when the batteries run out, and so in effect are also wired headphones. But they're not as good, and you pay a premium for the Bluetooth, so let's just leave that idea there and move on. With the P9 Signature, we're starting at the top of our chart in terms of quality and price – although true audio bores will know that £700 is really only entry-level, where things just start getting serious. What we love about these is that they aren't just for listening through tunes through an expensive CD or hi-res audio player and headphone DAC. They also do God's work when it comes to higher-bitrate compressed music played straight off your phone, to the point where you could actually wear them out and about. Er, well, you could if they didn't cost £700, didn't leak sound like a sieve and weren't enormous, and 'luxurious' brown. 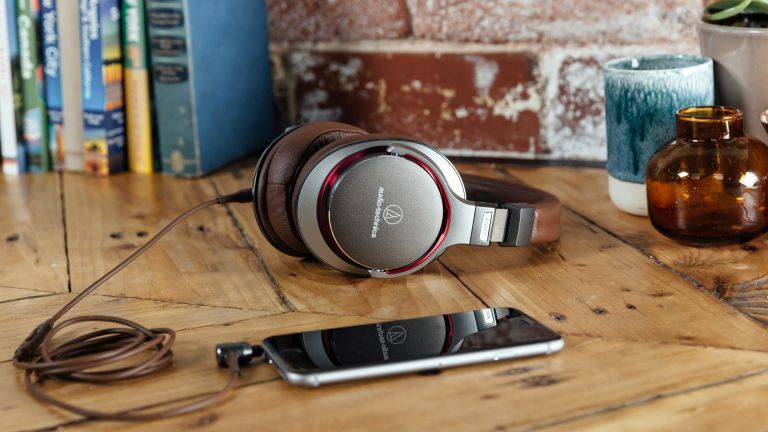 At home, however, and especially when plugged into a decent headphone DAC/amp like the all-conquering Chord Mojo, the P9 Signature gives a sound as chocolatey, rich and delicious as its leather ear cups. Whether the music is urgent, simple, laid-back, complex, poppy, avant-garde, loud, quiet, the P9 Signature delivers, with a big stereo sound stage, aided by drivers that are actually angled towards your ear holes. While the comfort is not as pillowy and wondrous as Philips' Fidelio X2, clever engineering of the joints between headband and cups, mean the memory foam cups are wearable for extended periods. Again not properly expensive in headphone terms, the ATH-A1000Z nonetheless does a great impression of a demanding pair of high-end cans. So much so, that if you're thinking about playing MP3 tracks through your iPhone you might as well forget it. These guys need a good running in, a decent amplifier or DAC, and something more like CD quality before they reveal their true colours. Behind the large matte red aluminium cups are two 53mm dynamic drivers, hand assembled in Japan, held admirably in place with a simple but effective magnesium alloy frame and padded wings that keep everything in place. It's not the most flawless system, but unless you're a true Conehead you shouldn’t have a problem. Being a closed back design it doesn't offer quite the same expansive soundstage as some, but on the plus side, it doesn't leak as much sound either, making them a better choice if you don't live alone. Sonically the ATH-A1000Z is extremely detailed, and despite the marginally smaller stage, instruments clearly have their place and it's a joy to pick out unheard detail, and bum notes in tracks. Acoustic guitars, string sections and vocals all soar, and while bass is deep and precise, it doesn’t thump. That may disappoint EDM fans, but it should delight classical music lovers. They've been around for a while now but the Momentum 2.0s remain the perfect trade off between looks, performance and long lasting value. Thanks to the double-hinged headband the Momentum 2.0, despite being full-sized, is highly portable and unless you go for some Active Noise Cancelling (and pay the premium) you'll be hard pushed to find something that sounds better on public transport. Build quality is faultless, the leather is plush, the memory foam ear pads supremely soft, and the metal suitably brushed. Sound quality is seriously impressive, with unexpectedly hefty bass performance, and the over-ear design cocoons the listener creating a wide soundstage really giving individual instruments the chance to shine. Energetic, precise and hugely enjoyable. And unlike a lot of Sennheiser's range, the look has a certain timeless style to it, rather than looking like something a BBC technician might have worn in 1976. Okay, we've slipped in some on-ears as well. That's because the updated P5 from Bowers & Wilkins works supremely well both at home and when struttin' down the high street, and looks very elegant indeed. On-ear headphones give a great mix of comfort, sound quality and portability for those who don't want the vast bulk of over-ears, but can't stomach invasive in-ears. B&W's P5 was a solid early entry into the wider consumer market from high-end speaker kings B&W. The P5 Series 2, however, is a huge improvement on the original, encompassing all the trademark audio quality and premium design associated with the brand. The sound here is warm, with excellent clarity and a great middle range. Unlike the first incarnation, while heavy bass may be lacking, they don't by any means lack oomph. If you're after headphones that you can wear on your commute as well as at home, the P5 Series 2 has been the on-ear king for several years now. Possibly the most comfortable pair of headphones ever, the X2 is big, bulky but sumptuous, with cloud-like ear pads that engulf the lugholes like nothing else. Sure, it looks hefty, and with 50mm neodymium drivers it should, but there's a lightness to the bulk, helped no end by the super soft hammock band that takes the strain. The all black design is also instantly appealing, with the combination of woven metal, leather and memory foam ear pads oozing class. They're the sort of headphone that looks great left nonchalantly atop the turntable. Pure class. Streaming via Macbook Pro using MQA Tidal Masters and a Chord Mojo DAC, the sweetspot of the X2 becomes instantly apparent, with a hugely enjoyable sound, gently dominated by the mid-range, but with a powerful bass levelling up the overall balance. The result is a smooth, spacious delivery that sounded equally enjoyable listening to the metronomic beat of Kraftwerk as the country twang of Courtney Marie Andrews. In the £200-£300 range, you've got a huge choice of great headphones, but if you're sold on a pair that never leaves the house, but doesn’t look like an unwanted guest, you'll not find better – or better value – than the X2. Despite being well under £150, these cans from Japanese audio ninjas Audio-Technica are made with premium materials and verge on the luxurious. In fact, they're a class act in every respect, and while a bit conservative, the sound generated from the 45mm True Motion Drivers makes up for the lack of bas assault. Performance is controlled but the result is a natural and well balanced delivery that your ears will love. In short: audiophile performance without the audiophile price. These are a very typical KEF product in that they have rather old-fashioned, very easy-to-listen-to audiophile qualities, mixed with highly distinctive, sharp styling. KEF M500 presents all types of music in an accurate, unfussy and highly involving way. They're more comfortable than they look, too – just as well, since you'll want to listen to them for hours and hours. Big, plush and superbly comfortable, these open-backed headphones have large earpads made of super-soft velour – yes, really, so 70s. They engulf even the largest lobes, with a squishy leather headband that offers plenty of adjustment. At £200, the HD599 isn't exactly cheap, and we'd expect decent sound quality at this price, but the effortlessly smooth performance in fact reminds us of significantly more expensive headphones. It's a lovely listen, with a tight, indulgent bass response, a well-positioned mid-range that loves a vocal, and the sort of space that's virtually impossible to achieve with closed back cans, especially at this price. Sennheiser has pitched the HD599 as an all-rounder, suitable for gaming and movies, and watching something loud and crashy. Fast & Furious 7 offered a hugely enjoyable, with a wide sound stage, surround sound effects and rumbling subwoofer performance. Now, as the HD599 looks like a discount DFS sofa – seriously Sennheiser, who signed off on the ivory and brown colourway? – if it was designed for use in public, we just couldn't recommend it. Since it will never leave the lounge or man cave, and offers a glimpse into the world of serious audiophile quality, we'll overlook basic aesthetics this time. From the vintage radio operator aesthetic to the shabby cardboard box packaging and pervading air of hand-built-in-Brooklyn cool, Grado is a brand synonymous with serious sound quality. Its new flagship PS2000e costs $2,695, but despite costing barely a 30th of that price, these simple, open-backed headphones deliver the goods. Admittedly, the design is a curious beast, and the old-school foam ear pads are initially uncomfortable compared to the plush leatherette we've become accustomed to, but you soon get used to them, and unlike some more cushioned models your ears are less likely to sweat. The compact on-ear size of the SR80e might tempt you to take them outside, but don't: they leak more than the SS Poseidon. Just sit back and enjoy the vintage Grado sound. Dynamic, full-bodied vocals, great pace and epic detail; all the work here is done in the mid-range, but be warned, these are a fit and forceful, rather than laid back, pair of headphones, with occasionally exacting standards. Poorer quality MP3s will suffer, as will poorly recorded tunes at higher quality. Most sub-£100 headphones don't concern themselves with this sort of pared-back, neutral performance, and if you want soft and smooth you should look back towards the high street. If, on the other hand, you want to breathe life into your music collection, and look like a New York hipster whilst doing so, you just can’t go wrong. It's not that we’re snobs at T3 – well, not all of us – but the idea of spending £30 on a pair of indoor-only headphones seemed laughable, especially with so many alternatives available. Then we listened to the AKG K52. This has absolutely no right to sound half as good as it does, even for twice the price. Okay, you can't expect these to sound as good as anything over £150, but for at-home listening they offer a massive soundstage, impressive balance and a frankly ludicrous amount of detail for the dosh. They start to struggle a little when pushed hard, and your ears will get fatigued quickly listening to heavier, electronic and hiphop sounds on the K52, but good ol' guitars and drums sound superb. Build quality is also a nice surprise, and while they’re obviously mostly plastic, the metal headband and super soft ear pads prevent them feeling cheap. They're lightweight, and while adjustment is rudimentary, they'll not slip off, especially given you'll not be raving or commuting in them any time soon. There is a certain lack of warmth to the sound, but if you appreciate the AKG's slight limitations before you buy, you'll come away feeling like you've robbed the store.